A good resolution for the new year that is easy to do and should not be forgotten is to start achieving financial solvency now and for the future. Whether your financial situation allows you to start with a big chunk of money or if you only can contribute a small initial sum, money adds up fast when you put some aside every month – especially if you start early in life. Surely, you’ve heard this song and dance before, especially if you’ve ever talked to Kathy, but before putting the idea aside for another day, take a look at the following savings projections developed from the savings calculator on our website. Use the calculator to play around with the calculator to see how much money you need to contribute annually to meet a desired amount by age 65. You also can determine how much will be saved by retirement if you contribute a set annual amount. 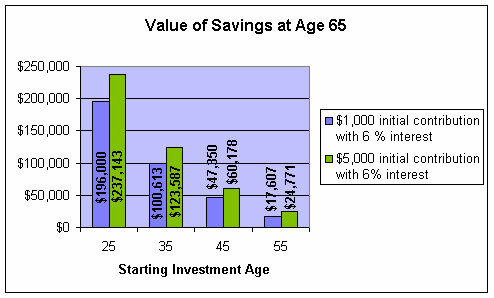 Also take a look at the following savings chart to see the affects of starting to save early in life, even with a small sum of money. Starting at age 25, if you start with $10,000 and continue to save $500 per month while earning 8% interest, you can be a millionaire at age 57. Under the same circumstances, if you start saving at age 35, you can achieve millionaire status by age 67. If you start saving at 45 under the same terms, you can be a millionaire by age 77, but if you wait until 55 to start saving, you won’t be a millionaire until age 87. Becoming a millionaire is feasible if you get started early enough in life. Even if you’re 50, you can save a hefty sum of money by the time you’re 70, if you just get started now. Studies show that the average American doesn’t start saving seriously until age 47. If you stick with the average, you could be missing out on a good 20 years of investment time. Take to heart the old saying, “Time is Money” when you invest for the future.